Where are all these lines coming from before a table? This doesn't happen with images, but when I add a table the final source that gets saved appears to have a zillion extra lines before the table. The screenshots show what I mean. (1) What it looks like while in the editor. (2) The editor "source", which looks just fine. (3) What the page looks like after saving (lots of white space). (4) The page source as seen after saving or when visiting the page. 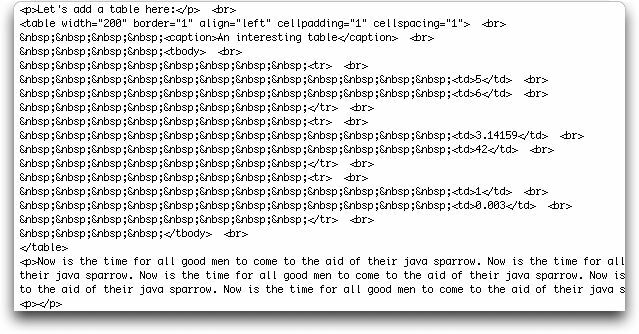 The html has loads of extra lines in it and all those nbsp entities. The question is, where did those all come from? (The editor here will only let me upload 3 screenshots. But there are lots of br tags before the table starts and lots of nbsp entities. Anybody see anything like this before? Re: Where are all these lines coming from before a table? 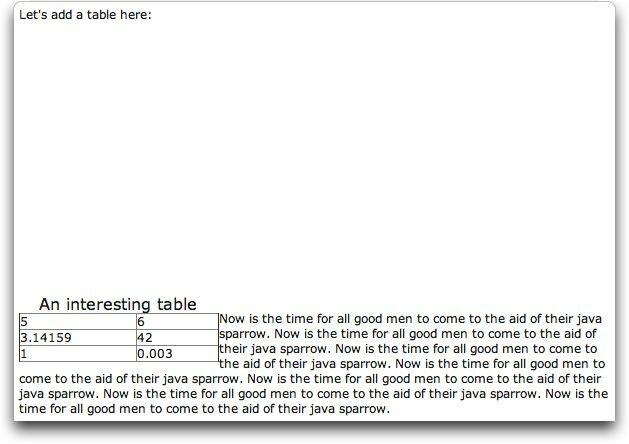 Here is the 4th image I wanted to show in the previous message - all those lines before the table... Agh! Actually, looking at the source displayed, there aren't excessive lines between the "Let's add a table here:" text and the beginning of the table. But there must be something about all those br tags that are causing the problem... Where are those coming from I wonder? before instantiating the editor and all those br tags went away and the entire source looks a lot cleaner and the result looks correct now. Perhaps you are right. At the very least, I do believe we convert line feeds into br tags. That is pretty common to do, I think, because ordinary users expect to have their line breaks maintained.